« MakerBot Update – PE00001 Online! 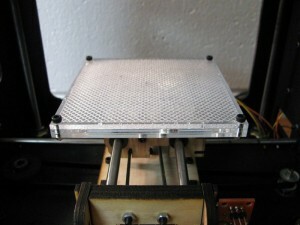 I posted two upgrades I've made to my MakerBot to Thingiverse this weekend. First is a build platform upgrade, which is just a quick mod that allows you to use "throwie" magnets to couple the build surface to the y-axis instead of the 1/8" cube magnets that come with the kit. While I like the original design, the larger magnets are easier to come by and you don't have to worry about them working their way out of the wood platforms over time because they're not held in place by friction. Second is the drop in Paxtruder. My MakerBot has been down for about 2 weeks now because I cracked my idler wheel. I decided to take this opportunity to play around with an alternative design someone posted to Thingiverse that uses a Delrin pusher rather than an idler wheel. I modified the design a bit so I could reuse the mounts and heater components without too much difficulty. I haven't been using it for too long, but I love that it takes next to no time to change filament with this design and that tension is ridiculously easy to adjust. 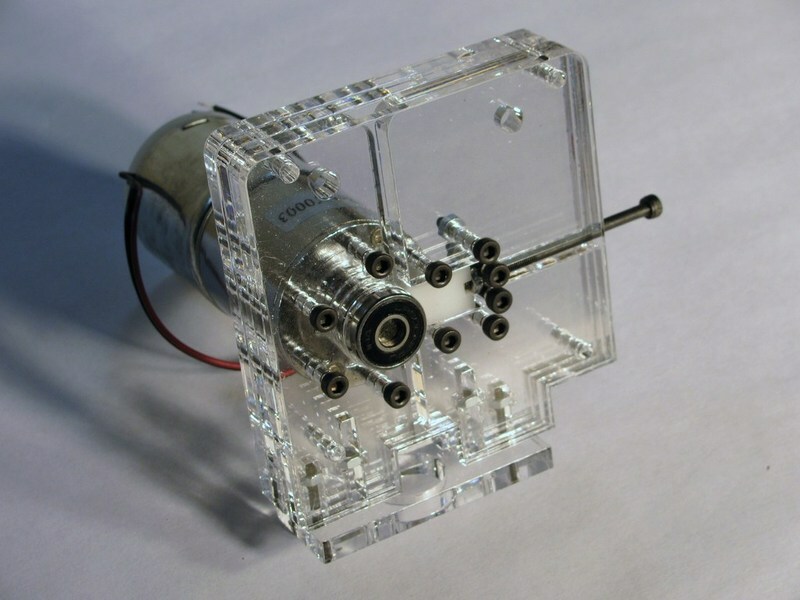 During the short time I've been using the new extruder, I've also noticed that the gear motor noise (and presumably load) seems more consistent as well compared to the idler wheel design. This entry was posted on Monday, November 30th, 2009 at 10:46 pm and is filed under News. You can follow any responses to this entry through the RSS 2.0 feed. You can leave a response, or trackback from your own site. Hey nice work on the Paxtruder. Looks easy to use with the adjustable tensioner. What kind of laser cutter do you have? I’ve got an Epilog Mini-18 in my shop. It’s a ridiculously useful tool for making Makerbot upgrades! I have a question about you guys awosmee services, would you guys be willing to do 3D prints with this kind of a 3D printer for people as a service?All the 3D print lab services I’ve found online are laser based, and all too high in detail and COST, some of us need 3D prototypes printed in the cheaper, rougher, Makerbot style. I could even be your first customer. All of us at North Street Labs love your laser service, but what about 3D printing as well?Thanks for the suggestion, Stephen. Will consider adding this service. But I think this will take some time to prepare. We are still waiting for the first new generation Makerbot’s arrival and play with it. Sorry it took so long to get back to you (WordPress doesn’t like to email me about actual comments now for some reason). We offer printing service at our space on a Replicator 1 and our own custom H-bot. It’s $150 a pound, which is about $2 or less for an hour of printing if I recall correctly, so it turns out to be pretty cheap per part, especially compared to Shapeways or other places. Send me some files if you want something printed. I can’t give you an accurate quote, but I can give you a rough one and we’ve got most colors in ABS and PLA currently.